Passengers are welcome to board our ship at 6:00 p.m. After comfortably settling into your cabins, we'll introduce our crew at a welcome cocktail. Join us on an excursion for both packages: Guided river boat tour of the old city. 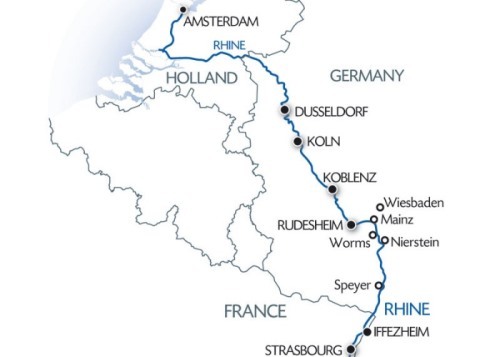 The morning will be spent cruising on the romantic Rhine towards Cologne. We'll set out to discover of the city before cruising to Düsseldorf. Tonight is our gala evening and dinner. The day will be spent cruising. Join us on an excursion for both packages: Tour of Amsterdam by night in a river boat. The afternoon, join us on an excursion for both packages: The Keukenhof floral gardens(1). Outside the opening dates of the park, guided visit of Volendam and Zaanse Schans. The evening is free to do as you please.